Over the course of life, I’ve often heard the phrase, I’m an independent thinker. I heard it so many times that I thought it was a goal of everyone as they grew up into adulthood and matured. I think when people say that, they somehow mean that they don’t just go with the flow but they create their own philosophies and beliefs and opinions themselves. My goal in raising my children was to teach them to learn to think for themselves and yet teach them that God’s Word is the foundation of where all their thinking should filter through, so that their thoughts are in harmony with what God thinks. I wanted them to learn to make decisions for themselves as they grew older, but tried to be a part of those decisions until they had enough knowledge, maturity, and experience to make them for themselves. As they became young adults, I released them and worked to stay out of their decision-making process because it was now their life, not mine. My goal from that point was to be the good friend whose ear they wanted to bend and ask my thoughts and opinions of. When I do share thoughts with them, I try to tread lightly so I don’t accidentally try to dominate their thoughts or decisions and push them away. This has helped each of them become a responsible adult that can make quality decisions independently of me—but not independent of God. My life’s role feels significant to me. As a Pastor, I’ve had the honor of influencing many lives for the Lord in a great diversity of ways. I’m fairly confident that I’m seen as a strong leader. I know how to and do think independently, but I also know how to flow in unity and cooperation with those I work with to reach mutually desired goals and objectives. Working together with others doesn’t affect my independence. It creates a healthy interdependence. I work with many strong and capable leaders. We all desire to focus on what is best for the people we serve and influence, yet it’s critical that we bring our thoughts into a larger big-picture plan understanding that not one of us has all the answers. We work to bring our thoughts into planning, effort and harmony in order to reach mutually desired goals of good for others. I’m extremely needy! 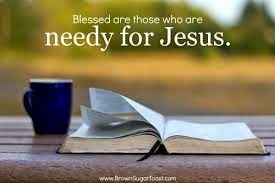 I am needy for God. I am needy for His love. I am needy for His assurance that He’s with me and will help me. I am needy for His wisdom because my decisions affect many people and I want my decisions to help and bless, not hinder and hurt. I am needy for the wisdom of good people who have gone before me who will help me avoid unnecessary mistakes that have already been made and should be learned from. I was needy for God to help me know the best way to raise my children. I was needy for Him to help me figure out how to make an income that would pay for my children’s schooling, and braces, and a thousand pairs of shoes, and college, and weddings, and so much more. I was needy. I still am. I need His wisdom for the decisions I face today! I am also needy for good relationships in my life. I am needy for anointed words from the throne of God for those that need them today. My life doesn’t work without the love and help of others. Yes I am independent but I am also needy—and that is God’s plan and it works wonderfully! Finally, I am awed that the God of this universe has made Himself so intimate and available always desiring me to bring every need to Him with assurance of His caring and help. I am awed at these words. 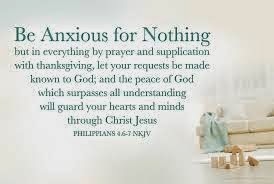 Philippians 4:6 (NIV) “Do not be anxious about anything, but in everything, by prayer and petition, with thanksgiving, present your requests to God.” He gives me the permission slip to be needy and have faith in Him and then strengthens my faith and confidence by these amazing words of assurance. 1 John 5:14-15 NIV “This is the confidence we have in approaching God: that if we ask anything according to His will, He hears us. And if we know that He hears us–whatever we ask–we know that we have what we asked of Him. 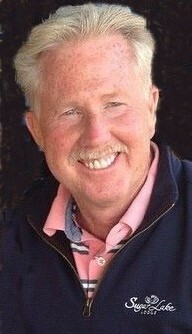 He said, “This is the confidence…” This is where the foundation of healthy independence comes from in my life. This is the reality of us all—that we can be independent and needy without being in conflict. It’s God’s desire for our life in Him through Jesus Christ! ← Does God Care About the Needs I Have in My Life? Thank you for sharing this! I really took to heart where to spoke about raising our kids to think independently but to have God’s word as the foundation for their thinking! Praise God! I am so glad it ministered to your heart! I pray that it helps you in more ways than you can imagine! God bless you!